In Utah, if a tenant makes a request to the landlord to send them their security deposit, whether in writing or by other means and fails to get a response, then they need to send a strong warning using this Security Return Demand Letter. Utah landlord/tenant laws requires that security deposit must be returned within 30 days after the tenant leaves the rented premise or 15 days from when they received the tenant’s forwarding address. Deductions can be made only if there are unpaid rental bills, damages on the property which is beyond the day-to-day wear and tear and to cover cleaning costs if the unit is dirtier than when the tenant moved in. Wrongfully withholding security deposit comes with legal consequences to the landlord if the tenant takes the matter to court. This letter lets the landlord understand that it is to their best advantage to avoid the legal penalties by paying the owed amount. Resolving the matter out of court is speedier and a well-written security demand letter is the best way to do that. This HomeTitan’s Security Deposit Demand Letter refers to the Utah landlord/tenant laws with regards to the landlord’s willful violation of retaining the tenant’s security deposit. Simply downloading, filling and sending this letter can resolve the matter without going through the stressful court proceedings. Although communicating through the phone or verbally with the landlord is possible, you should always document whatever has transpired to avoid any future dispute. To get a return receipt and proof of delivery, send this letter via certified mail and keep yourself a copy. 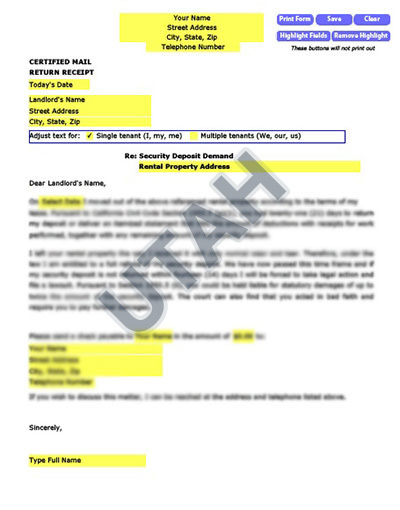 Our letters for Utah renters are tailored to your state, with the right laws to get your landlord’s attention. We’ve taken care of the Security Demand details so there’s no hassle on your part to find the right law and craft an approrpriate letter. Our letters have been used in Utah and all over America with great success.